This weekend marks the unofficial beginning of summer in Canada. That means the snow has finally melted which will clean up the roads for guys like us to burn some rubber. Not that we lovers of speed need anything to motivate us to put the loud pedal to the floor but one of life’s great pleasures is to crank the tunes and have the wind whip through our hair (or what hair some of us have). However, only certain tunes have you driving full throttle. We’ve never really feature a lot of Mila Kunis so here’s a small attempt to make up for it. Minka Kelly was at the People’s Choice Awards last week. Easy to see how she could be a people’s choice. If it’s not worth talking about, then it must be time for the Not News of the Week. For the second-last time, The Lowdown hit the airwaves of London, Ontario. It was another summer themed episode as the boys spent most of the episode talking about cars and driving. The episode started with a look at some of the best driving songs ever made. They follow this up with a pair of news stories about a teacher in a goth band (which degenerates into a discussion about drunken debauchery) and a soccer player who got carded for dropping dead. In entertainment, Jackie’s got an all-NBC single of the week while It Came From YouTube has a superstar cover of Don’t Stop Believing. After the break is the return of the Car Wall with four different types of cars are added. The show is capped off with the return of Oddsmakers. It’s a crammed 28 minutes that ranks among our best episodes of the season. On Lowdown Extra, there’s another song for the greatest driving songs list, another car for the Car Wall and a motorsports question added to Oddsmakers. The cuts of the greatest driving songs are longer. Two more stories make the news including one about cars. The Worst of Music returns to the original intro but has a new band called 3Oh!3 picking up the award. After the break in the Extra, the boys (mostly Steve) go off the deep end as they breakdown a review of the show sent to Steve by a radio station that the radio show is syndicated to. The boys pick apart everything from the lack of logic of the reviewer to the grammar of the review. Basically, they reviewed the review and had a laugh doing so. In all, this week’s Extra is a whopping 105 minutes. That’s nearly two hours of continuous Lowdown insanity. As always, the action is uncut and extremely uncensored. Click here to download The Lowdown Extra. If it’s Tuesday, then this must be more of all the news that’s not fit for print. It’s time for the Not News of the Week. A 53-year-old softball player lost a line drive in the setting sun during a game in 2004. The ball hit him, breaking two fingers, cutting him for 20 stitches and smashing his sunglasses which damaged his right eye. Naturally, in this litigious society in which we live, the man has now filed a lawsuit. But he’s not suing the batter who hit the ball or the pitcher who lobbed it up or the bat manufacturer who made an implement of destruction that could crush a ball that hard. No, he’s suing the owner of the ballfield for not providing adequate protection from the dangers caused by the setting sun nor warning players of potential dangers caused by sunset. How, at 53-years-of-age, can someone not know that you won’t see small, round objects when staring directly into the sun? Just more proof that nothing is your fault anymore. Last week, we had a story about a man so drunk that he broke the roadside breathalyser. This week, we found out about a Pennsylvania man who decided to get bombed on a weekday afternoon. He was found by a state trooper on the side of a highway giving what looked like mouth-to-mouth resuscitation to a dead opossum. Witnesses said that the man also appear to have conducted a séance at one point. I know some folks in the southern states are stereotyped as being regular eaters of roadkill but I don’t think they’re that concerned about how fresh it is. Sometimes, making a dramatic entrance isn’t all it’s cracked up to be. An 82-year-old woman had a little trouble parking her car and crashed through the front window of a hair salon. She says she accidentally hit the accelerator instead of the brake which caused her car to leap through the window and that she was very embarrassed by the whole episode. Well, if crashing through the window wasn’t embarrassing enough, she had to stay at the salon for her appointment. Yes, she got her haircut as they were towing her car out the shop’s front window. Now that’s embarrassing. It wasn’t an April Fools joke so it’s understandable that people freaked when Orson Wells broadcast his infamous War Of The Worlds radio play. The mayor and citizens of a small town in Jordan has less of an excuse for being duped by an April Fools joke played on them by the local daily newspaper. The Al Ghad newspaper published a report saying that a UFO landed near the town of Jafr and lit up the night sky which sent citizens panicking into the streets. Now, anyone in the town would have noticed that all happening. Well, anyone except for the mayor of Jafr. He closed the town down for the day, deployed security forces to search for the aliens and nearly evacuated the town. When he was let in on the joke, suffice to say, he wasn’t a happy camper. The mayor is considering suing the newspaper (supposedly) for an erroneous report that caused him to scramble forces at great cost. Really, though, he’s suing to recover some of his dignity. The American’s do a lot of bizarre things. 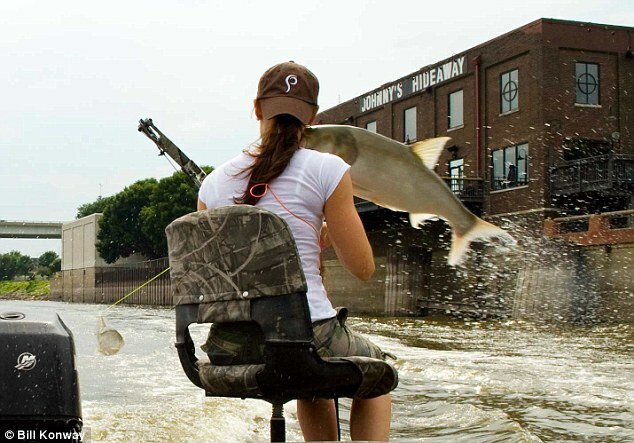 One such thing is hunting Asian Carp on the Illinois River using a bow and arrow. Well, one carp didn’t take his fate lying down. While a group of friends were out fishing on the Illinois, a carp flew out of the river and slapped one of the bow and arrow fisherwomen. Fortunately for us, one of the crew had a camera and recorded the moment for posterity. I don’t care who you are, that’s gotta hurt. It’s that time of week again. If it’s not worth talking about, then it’s definitely the Not News of the Week.